A fitting encapsulation of Gregory Maguire’s newest book, After Alice. Maguire is well known for his thoughtful expansions upon established worlds: Wicked and Confessions of an Ugly Stepsister explored the worlds of Oz and Cinderella from the unexpected perspective of those stories’ antagonists, while Mirror, Mirror mixed medieval Tuscan history and a return to the dark roots of fairy tales to the Snow White story. 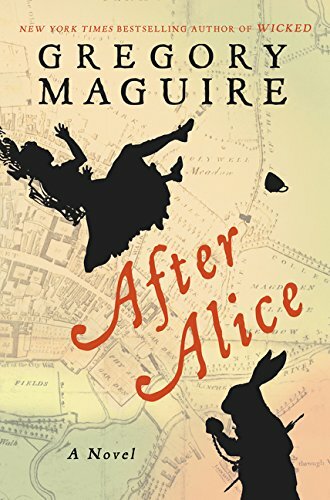 In After Alice, Maguire’s reach is more ambitious than even those successful stories. Told from the perspectives of two characters who are mentioned only in passing in Lewis Carroll’s Alice in Wonderland and Through the Looking Glass, After Alice is Maguire’s imagining of what happened both above ground on the day Carroll’s heroine disappeared, and what might have happened had someone followed her. Ada (she of the curling hair, mentioned briefly in chapter two of Alice in Wonderland) is Alice’s lone friend. Sent from her chaotic home with a pot of marmalade to visit Alice’s family, she first meets Lydia, Alice’s inattentive sister, who directs Ada to the spot she last saw Alice. In her curiosity, Ada falls (literally) victim the same rabbit hole that swallowed Alice, and soon descends to Wonderland. One thread of Maguire’s narrative concerns Ada’s search for her lost friend, and her meetings with both well-known (including a significantly more dreadful Cheshire Cat) Wonderland denizens and some new characters. The second thread of his story concerns Lydia, another very minor character in Carroll’s book, and the languid half-search she conducts for her sister. Accompanied mainly by Ada’s love-struck governess, Lydia never quite believes Alice is genuinely lost. In her grief over the loss of their beloved mother and in the midst of the self-absorption of a fifteen year old, she is far more concerned with catching the eye of the handsome American travelling with her father’s guest, Charles Darwin. Class conflict with Miss Armstrong, Ada’s governess, is also on her mind: Should she listen to the older and more experienced, yet socially lower class, woman, or does the benefit of her class afford her a sort of genetic wisdom? Maguire weaves these threads together with a deft hand, interspersing Ada’s adventures in looking for Alice with the more mundane search going on above ground. He does so by means of a story conceit not often used: he attempts to capture Carroll’s style. Through means of jokes, puns, and slightly scandalous ditties, combined with the elevated vocabulary that was very common in Victorian literature, Maguire evokes both the time period and Carroll himself. The literary device has mixed success. For a reader who is enamored of writing of that time (and who has an expansive vocabulary), the book will be a joy. Maguire is playful with his sentences: “I was a mere abbreviation of what I would become, I was already brittle, loathsome, and fatuous,” advises the Duchess. She goes on to tell Ada that brittle is a contraction for brilliant and little, loathsome a contraction for loquacious and thoroughly toothsome, and fatuous a contraction of fat and fabulous. Plays on words were a Carroll standard, and Maguire plays along with that device. His Ada is determined and steady, straight man to comical characters galore. The Victorian novel-style might fail, however, for those unwilling to savor language, or to wade through expository chapters, many of which deal with social conditions and expectations of the era. Carroll did the same things in Alice in Wonderland, but he was writing to an audience who lived those social mores and had a personal understanding of the times and then-common narrative devices. Modern readers might be put off by a story that feels like it meanders (or lollops, a word used often and with great relish by Maguire) from event to event, with many side roads explored. Ada is a delightful protagonist. At once plodding and fanciful, she is able to pursue her friend while still accepting of and enjoying the odd characters that abound in Wonderland. She has the same sort of clear-eyed but hopeful view of her life. Perhaps it is noted a bit too often that she is unattractive, but Ada herself refuses to let her appearance define her. Ultimately, she throws off her metaphoric (and physical) chains, and we shout her triumph. Lydia is a less sympathetic character, and is central to the less interesting part of the story. Perhaps it is because she is the focus of explorations of Victoriana that are more esoteric to the modern reader: class structure, religion, and racism devolve on her narrow teenage shoulders. Had she been more likable, the moralistic aspect of this book might have been more palatable; as the story sits, though, those bits are awkward. Side stories about Darwin and his theory of evolution and the American Civil War feel shoehorned in because they are of modern interest. Victorian views of both are barely touched upon. The anonymous card dealing hand of the quote used above is that of Maguire, and his characters are dealt cards both seemingly random and hostile (there is a brief section that flirts with an idea of the children’s fate that is far worse than the dream Carroll intimated), but he appears to be mainly amused by playing with narrative style and language. After Alice is a mixed bag for the reader, especially those enamored of Carroll’s original tales. Though those readers likely will be most comfortable with the style of the narrative and with the elevated vocabulary, they may be put off by the forays into life outside of Wonderland. For anyone who can be tolerant of a little moralizing and anachronistic historical perspective and who loves the playful use of rich language, this book is a wonderful companion to Lewis Carroll’s classic tales.